During the 2008 primary, some of Clinton’s rhetoric left black voters cold. She’ll need to overcome those lingering concerns to win in 2016. After Hillary Clinton announced earlier this week that she will seek the Democratic nomination for president, an image that’s periodically made the rounds in recent years resurfaced. 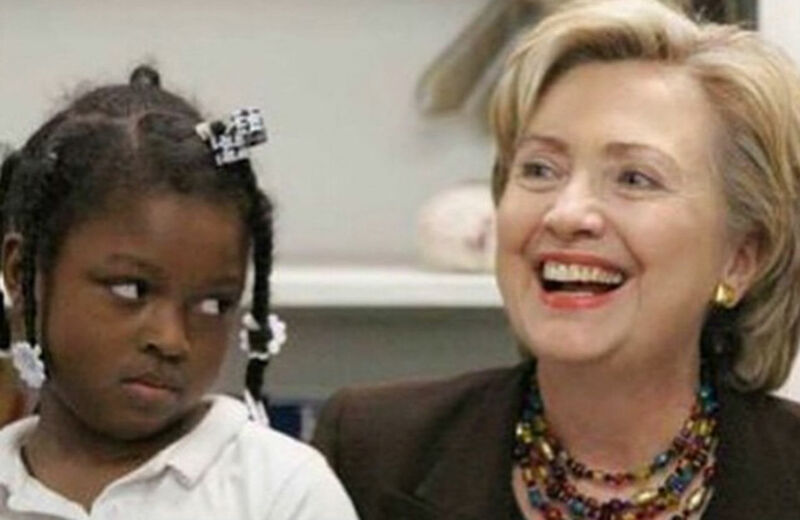 It’s a photo, perhaps PhotoShopped, of Clinton engaged in what appears to be a good-natured laugh while a little black girl standing next to her gives the pol a perfected side eye. One friend, a black woman, texted me the image—no words, just the image—Monday morning. A Facebook friend, also a black woman, made it her profile picture soon after the announcement. The deep cynicism and obvious exasperation of the little girl, or of whoever thought to create this now-viral mash up, speaks volumes about a hurdle Clinton will need to clear as she courts black voters—particularly black women voters—this election cycle. As I’ve noted before, black women are often called the most reliable progressive voting bloc, with their participation in 2012 contributing to a higher turnout rate for black voters than for those who are white for the first time ever. If Clinton’s efforts at a more family- and woman-friendly campaign fall on deaf ears in black communities, that spells trouble for her. “I have a much broader base to build a winning coalition on,” she said in the interview, citing an article by The Associated Press. It “found how Senator Obama’s support among working, hard-working Americans, white Americans, is weakening again, and how whites in both states who had not completed college were supporting me.… There’s a pattern emerging here,” she said. The audio from that interview was especially upsetting, because of the way it sounded as if Clinton were saying that “hard-working Americans” and “white Americans” are synonymous. That earlier slip makes it easy to meet her current repeated promise to champion the interests of “everyday Americans” with one of those side eyes. Who does she mean this time around? On Sunday, the multiracially cast video that Team Clinton released to announce her candidacy hits a lot of the right notes in terms of communicating inclusivity. There’s the glowing black couple preparing for the birth of their son, the adorable black child talking about dressing up as a fish for an upcoming play. But beyond the symbols, Clinton will need to make sure she avoids galling missteps this time around. I’m thinking also of her insistence during one 2008 debate that Obama reject—not “denounce” but “reject,” she was adamant about the language—any forthcoming support from the Nation of Islam’s Louis Farrakhan. Sure, it’s understandable that Clinton would scramble for whatever points this might win her from a segment of the American public, those “hard-working Americans” she would later claim to have in the bag. But by acting as if the Nation of Islam were the one-dimensional bogeyman it’s made out to be in the mainstream, as opposed to a more complex purveyor of a brand of black self-reliance that’s an indisputable part of this country’s history, Clinton showed she was willing to stoke irrational fears. At that time, the Clinton Foundation office had chosen 125th St. in Harlem as its home and was situated not even a block from a street named after Malcolm X. But Obama had to not just denounce but reject the Nation, or else risk his blackness becoming even more of a liability? Yes, because it could have been a way for Clinton to get the edge she so desperately needed. These are just two examples of Clinton hitting a sour note when it comes to communicating—even subtly and inadvertently—with the black electorate as a presidential candidate. The policy positions she’s taken over the course of her career have been outlined at length elsewhere. To some, progressives’ ability to influence policy in a Clinton administration and how much is at stake in the upcoming election far outweigh rhetorical choices Clinton made when her back was against the wall in a tough primary. But those small choices go a long way toward helping us understand why some black voters feel alienated, why dog-whistle politics are never a good idea and why that image of the side eye has gone viral.